The discovery of offensive missiles in Cuba provided precisely the pretext that the United States would need to launch an invasion of Cuba. The opportunity was passed by. Whatever the views of his military colleagues, Maxwell Taylor hoped to avoid an invasion-an option “we should look at very closely before we get our feet in that deep mud in Cuba.” He could envisage a long commitment, tying down conventional forces in the face of a guerrilla campaign. ExComm spent very little time discussing this option, though its members appreciated that it was implied as soon as serious military action began. It might become a dire necessity, but with the emphasis on dire. By 21 October the planning had come to focus on men being put ashore seven days after air strikes, with as many as 25,000 arriving on the first day, building up to 90,000 over the following week. The preparations were put in train and many units moved to Florida, eventually involving 100,000 army and 40,000 marine combat troops, but hard analysis of the reception occupation troops might have received was lacking. Plans involved 579 tactical aircraft and 183 ships, including 8 aircraft carriers. They assumed an estimated 18,500 American casualties in ten days of combat. The intelligence on the number of Soviet troops available to fight was inaccurate. Instead of facing only indigenous Cuban troops, American forces would have found themselves confronting Soviet combat units. There were estimated to be just 8,000 Soviet military personnel in Cuba until 22 October, when this was revised upward to 10,000. Two days later the estimates jumped up to 22,000. Soviet sources later claimed that the actual number was twice as high: 41,902 as against 45,000 planned. Considering the size of the problem, the equipment that is involved on the other side, the Nationalists’ fervor which may be encouraged, it seems to me that we should end up bogged down. I think that we should keep continually in mind the British in the Boer War, the Russians in the last war with the Finnish and our own experience with the North Koreans. As with Berlin, it took a real crisis to bring home the full meaning of strategic moves discussed almost casually in military war games, thinktank seminars, and any number of Washington meetings. OPLAN 312 was the air strike; OPLAN 314 was for a subsequent land invasion; OPLAN 316 was a variant of 314 with less time for the invasion force. General Taylor summarized the conclusions of the Joint Chiefs. Unless the missiles are defused immediately, the Chiefs recommended implementation on Monday 29th October 1962 of OP Plan 312, i.e. a major air strike, and, seven days later, OP Plan 316, which is the invasion plan. SAC is maintaining 1/8 airborne alert and has implemented its force dispersal plan. An increased SIOP generation rate–1,456 aircraft and 355 missiles, including 80 Polaris missiles–is being maintained. Continental Air Defense Command interceptor forces have occupied their wartime dispersal bases and are partially deployed at increased alert (about 1/3). Special defensive measures have been taken to protect the Southeast, with particular attention to Florida. Air forces involved in CINCLANT OPLAN 312-62 in daylight hours can respond for selective attack in graduated increments from two to twelve hours, according to the application of force desired. Amphibious and assault forces are at a high state of readiness, providing a seven-day reaction capability for CINCLANT OPLAN 316-62 following the air strike (CINCLANT OPLAN 312-62), with accelerated introduction of follow-on forces. All naval units are in a high state of readiness. In response to your request, we have studied the need for augmentation of forces for CINCLANT OPLAN 316-62 and have concluded that while the forces originally included in the plan are probably adequate, it would be prudent to earmark additional forces as a ready reserve for the operation. Accordingly, we are planning to earmark the 5th Infantry Division, at approximately 20,000 strength including supporting forces, and a combat command (strength 6,800) of the 2nd Armored Division for possible commitment as reserve forces for CINCLANT OPLAN 316-62; but these units will not be moved from home stations until S-day for OPLAN 312-62. Utilization of the increased Army and Marine forces will require an additional 16 transports, 68 cargo ships, and 11 LSTs. The LSTs and 15 transports would come from the Reserve Fleet, would require approximately 45 days to activate and assemble on the east coast, and would cost an estimated $28 million. For the total shipping requirements of the augmented Plan, chartering, requisitioning, and prepositioning of 60 cargo ships must be accomplished well in advance of execution of the Plan. The chartering/requisitioning of the remaining 105 cargo ships would require at least 30 days. The 5th MEB (Marine Expeditionary Brigade), at approximately 9,000 strength, has transited the Panama Canal, is in the Caribbean and has been added to the assault force. The Joint Chiefs of Staff recommend staying in the present posture for the immediate future. 2 For a description of CINCLANT OPLAN 316-62, see footnote 1, Document 150. 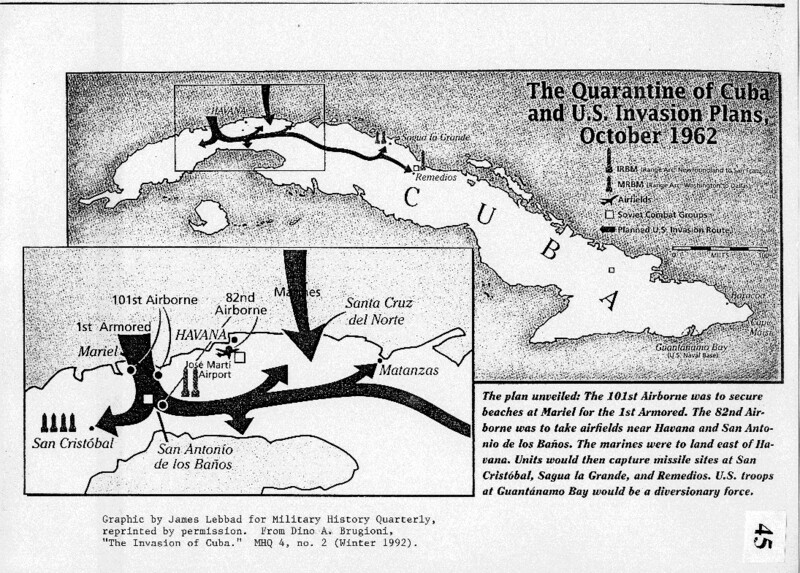 Source: Kennedy Library, National Security Files, Countries Series, Cuba, General, 11/16/62-11/20/62. Top Secret. As I have communicated to General Wheeler, through General Clifton, the plans for X seem thin. Considering the size of the problem, the equipment that is involved on the other side, the nationalistic fervor which may be engendered, it seems to me we could end up bogged down. I think we should keep constantly in mind the British in Boer War, the Russians in the last war with the Finnish and our own experience with the North Koreans. We are keeping, as I understand it, three divisions in reserve. I think we should plan to use them and call up any guard divisions we have available. This may require us to build additional divisions. Source: Washington National Records Center, RG 330, OASD (C) A Files: FRC 71 A 2896, Cuba 1962 (McNamara’s working papers). Top Secret. 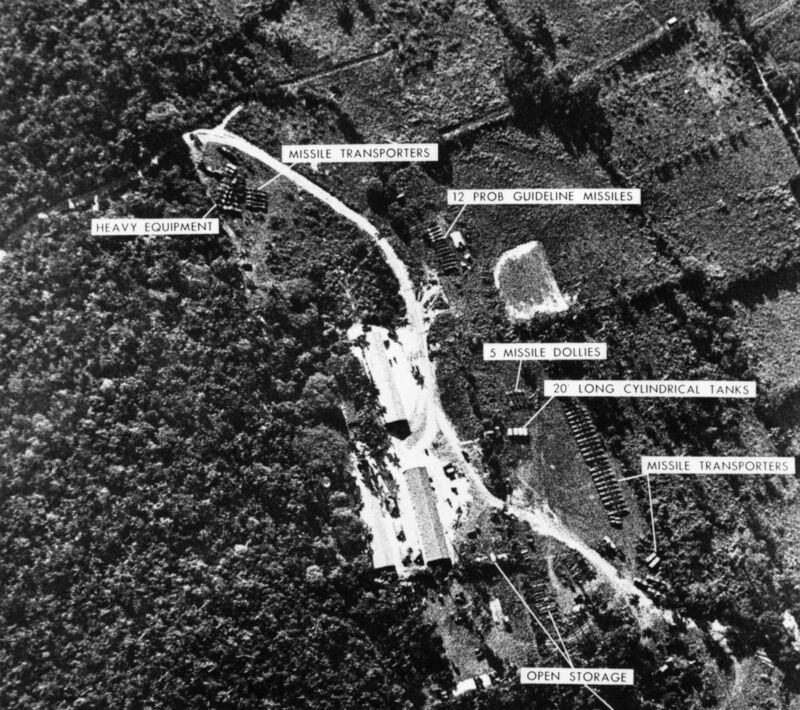 In October 1962 missiles were discovered by way of U-2 flights in the Marxist regime of Fidel Castro. These medium-range missiles had the capability to hit all of the United States (except for parts of the northwest) with nuclear warheads. It didn’t take much imagination to figure out exactly WHO these missiles belonged to. Soviet ships were shuttling back and forth between the USSR and its newest puppet. And the amount of borscht being served at Cuban cafes simply skyrocketed. Even the CIA couldn’t miss the implications. There were three options to deal with the Soviet missile threat (four if you count waffling): blockade the island and prevent more missiles from arriving, launch airstrikes to destroy the missiles before they could be used, or launch a land invasion to capture the launch sites. As it was believed that the sites were not yet operational the three options were to be executed in sequence, beginning with the “naval quarantine” of Cuba. An airstrike would be launched once U.S. Army troops were ready to land. Soldiers of the XVIII Airborne Corps would land west of Havana. The invasion plan was named Operational Plan 316. While the Air Force proceeded to identify targets and stage aircraft and munitions in Florida, Georgia and South Carolina, U.S. Army units moved to staging areas in Florida while military hospitals in southern posts were quietly prepared to receive large-scale casualties. Army boat units were moved to Fort Lauderdale and Port Everglades. There was difficulty in finding space for all the soldiers who would be making the amphibious landings, especially since the operation was initially veiled in the fiction that it was a large-scale exercise. Some soldiers of the 1st Armored Division were billeted at a racecourse in Hallandale. The 101st Airborne and 82nd Airborne Divisions were prepared for their jump into Cuba. The 101st was to seize control of beaches around Mariel Beach while the 82nd took key airfields in the path of the 1st Armored Division, which would be landing at Mariel. Once Havana was cut off and/or secured with the help of Marines slated to land east of the city, the tanks of the 1st Armored would roll straight to the missile sites and take them out… taking care to treat anyone with a Boris Badinoff accent with the utmost respect. In the end the Soviets blinked. Faced with a simple statement that a missile attack against the United States from Cuba would be treated as an attack from Soviet territory itself and that the United States would retaliate in kind, Khruschev backed down. So long as Cuba was not invaded the missiles would be dismantled and sent back home. The Soviet ships taking them back to the Motherland were even obliging enough to uncover the missiles loaded on the decks so that U.S. recon aircraft could photograph and confirm their departure. Before the Army units were sent back to their home stations there was a parade of sorts, with President Kennedy personally travelling to the many staging areas where soldiers were had prepared to storm Cuba. Today the invasion plan is largely forgotten, but had World War III started the opening move would have been to take out the USSR’s advanced missile base in the Western Hemisphere.